ESA astronaut Alexander Gerst will return to Earth alongside NASA astronaut Serena Auñón-Chancellor and Russian cosmonaut Sergei Prokopiev on 20 December. After more than six months living and working on the International Space Station, their Soyuz is expected to touch down in Kazakhstan at around 05:06 GMT (06:06 CET). The trio’s journey from the Space Station to Earth will take approximately three hours, during which the speed of their Soyuz capsule will reduce from 28 000 to 0 km/h. An investigation delivered to the International Space Station aboard Northrop Grumman’s tenth commercial resupply services mission (NG CRS-10) in November may help uncover the electrifying origins of our solar system. The Experimental Chondrule Formation on the ISS (EXCISS), housed in a NanoRacks container, aims to replicate chondrule formation as seen in the early solar system. Rekord-Raumfahrer Alexander Gerst kommt heim – als Nächstes zum Mond? 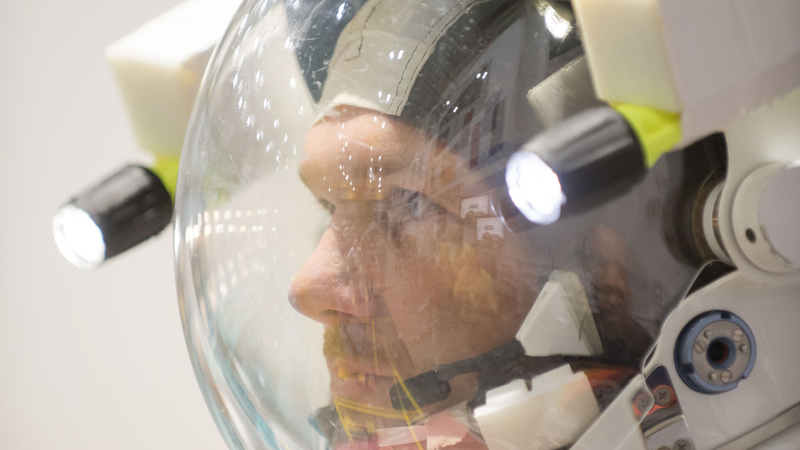 Am Ende seiner Mission wird es für den deutschen Astronauten Alexander Gerst an diesem Donnerstag (20. Dezember) eine raue Rückkehr aus der Schwerelosigkeit zum Heimatplaneten Erde. Nach dem Abkoppeln von der Internationalen Raumstation ISS rast die enge Sojus-Kapsel zunächst ungebremst in die Atmosphäre, die Luftreibung erzeugt dabei Temperaturen von etwa 2500 Grad Celsius. Erst vor wenigen Wochen ging der Start einer russischen Sojus-Rakete schief, und auch die Rückkehr der Raumkapsel gilt als anspruchsvoll. At 21:40 GMT (22:40 CET) on Tuesday 18 December, ESA astronaut Alexander Gerst will hand over command of the International Space Station to Russian cosmonaut Oleg Kononenko. The ceremony will be broadcast live on NASA TV below and is one of the final acts of Alexander’s Horizons mission before he returns to Earth alongside NASA astronaut Serena Auñón-Chancellor and Roscosmos cosmonaut Sergei Prokopiev on Thursday. Astronauts Alexander Gerst and Serena Auñón-Chancellor and cosmonaut Sergei Prokopyev will share their Soyuz with vital science when they return to Earth on Thursday 20 December. A number of ESA experiments are destined for researchers on Earth. These include the Plasma Kristall-4 experiment, which has been recording data on how atoms behave using microscopic plastic particles in plasma. Eight hard disks containing three terabytes of precious scientific research will be coming home strapped above the astronauts’ heads. Der deutsche ESA-Astronaut Alexander Gerst hat am Mittwoch das Kommando in der Internationalen Raumstation ISS an seinen russischen Kollegen Oleg Kononenko übergeben. Der setzt nun gemeinsam mit der Amerikanerin Anne McClain und dem Kanadier David Saint-Jacques (Foto) als nunmehr 58. Stammbesatzung die Arbeit allein in der Station fort. Seine Rückkehr hatte sich verzögert, jetzt soll es klappen: Astronaut Alexander Gerst kommt nach einem halben Jahr von der Raumstation zurück. Und es gibt schon neue Pläne. Science on the International Space Station has been a hot topic throughout ESA astronaut Alexander Gerst’s Horizons mission. But the research does not end when an astronaut returns to Earth. ESA Baseline Data Collection (BDC) coordinator Mark Mouret is responsible for ensuring vital ground-based data is collected as a reference point for in-space measurements. We asked him why it is so important and what Alexander has in store. NASA’s Mars InSight lander has settled into its new home on Elysium Planitia and is preparing to deploy its instruments — and if all goes well, one device’s work should be complete by March. That instrument is InSight’s self-hammering heat probe, nicknamed the „mole,“ which is designed to measure heat production and flow within the interior of Mars. To do that, the instrument has to drill down about 16 feet (5 meters) into the Martian regolith — and that procedure is currently scheduled to begin in January, the mole’s principal investigator said yesterday (Dec. 11) during a presentation at the annual meeting of the American Geophysical Union. This is a HiRISE image of the NASA InSight lander, plus other pieces of hardware on Mars after its successful landing on 26 November 2018. It looks like the heat shield (upper right) has its dark outside facing down, since it is so bright (saturated, probably a specular reflection). The lander (middle) disturbed dust over a fair distance and has darkened the surface, as seen previously at the Phoenix and Curiosity landing sites. The bright spot associated with the lander is probably another specular reflection, and there are two smaller bluish extensions that are the solar arrays, plus their shadows. On Nov. 26, NASA’s InSight mission knew the spacecraft touched down within an 81-mile-long (130-kilometer-long) landing ellipse on Mars. Now, the team has pinpointed InSight’s exact location using images from HiRISE, a powerful camera onboard another NASA spacecraft, Mars Reconnaissance Orbiter (MRO). The InSight lander, its heat shield and parachute were spotted by HiRISE (which stands for High Resolution Imaging Science Experiment) in one set of images last week on Dec. 6, and again on Tuesday, Dec. 11. The lander, heat shield and parachute are within 1,000 feet (several hundred meters) of one another on Elysium Planitia, the flat lava plain selected as InSight’s landing location. 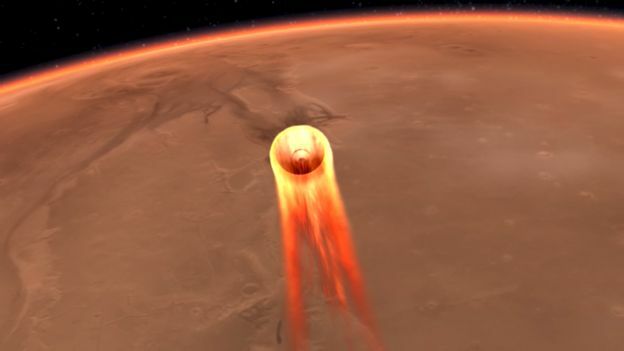 Mars Reconnaissance Orbiter may not have managed to spot InSight under its parachute, but it has finally spotted the lander, its parachute, and its heat shield resting on the Martian surface. The images confirm the location of InSight’s landing site, a little to the north and west of the center of the landing ellipse. Dem Mars Reconnaissance Orbiter (MRO) der NASA ist es gelungen, wenige Tage nach der Landung Fotos von der Marssonde Insight zu machen. Auf den Aufnahmen ist nicht nur die Sonde mit ihren charakteristischen Solarpaneelen, sondern auch der vor der Landung abgeworfene Hitzeschild und der Fallschirm sichtbar. Die drei Teile liegen einige Hundert Meter auseinander und sind auf Fotos vom 6. und vom 11. Dezember erkennbar. Aufgrund der Oberflächeneigenschaften seien die Farben des reflektierenden Lichts verfälscht, erklärt die US-Weltraumagentur dessen grünblaue Farbe. 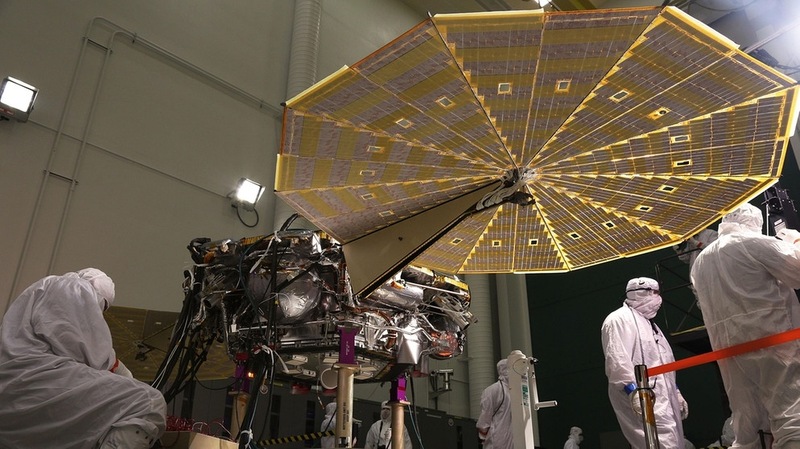 NASA’s new Mars lander isn’t quite ready to probe the Red Planet’s interior yet, but it’s starting to get the lay of the land on the surface — and in the atmosphere. The InSight lander is already deploying its powerful meteorology package to monitor the Red Planet’s weather. InSight touched down on the Martian surface Nov. 26, and since then it has been carefully analyzing its environment and setting up its sensitive suite of instruments. The mission’s seismometer still sits on the lander’s deck, measuring InSight’s vibrations rather than the planet’s, and the heat-sensing mole remains undeployed as well. But the lander’s meteorology suite is already gearing up to measure the pressure, temperature and three-dimensional wind patterns on the Red Planet. Thankfully, NASA’s InSight Mars lander is far better at the claw game than I am. The robot, which landed on the Red Planet on Nov. 26, has already used its claw-like grapple to snag one of its main science instruments, as a newly released image sequence shows. You can see a video of InSight’s Martian claw game. NASA astronaut Nick Hague is excited to clamber atop a Russian Soyuz rocket 11 weeks from now, even though his first experience with the booster didn’t go so well. Half of the Expedition 57 crew is getting ready to depart International Space Station while the other half is getting used to life on orbit. 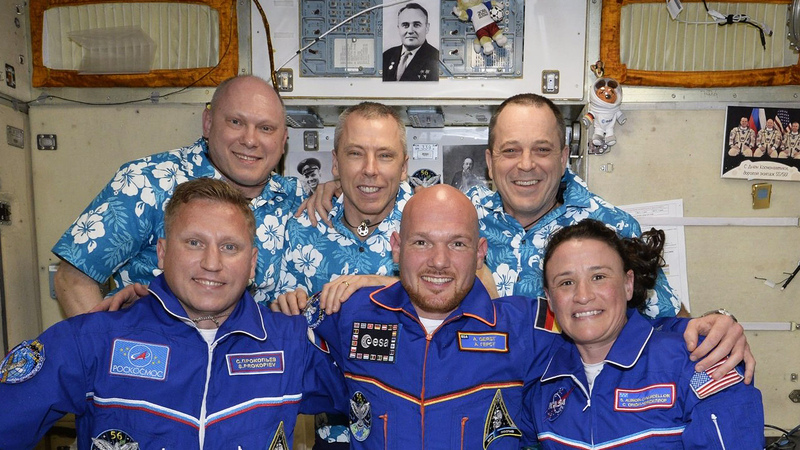 Amidst those preparations, all six space residents are researching what microgravity does to their bodies while keeping the orbital lab in tip-top shape. Commander Alexander Gerst continues unpacking the Space Dragon cargo craft today with its near 5,700 pounds of science, supplies and hardware. The German astronaut from ESA (European Space Agency) is also packing the Soyuz MS-09 crew ship that will take him and two crewmates home next week. He’ll parachute to a landing aboard the Soyuz in Kazakhstan Dec. 20 at 12:03 a.m. EST with fellow crew members Serena Auñón-Chancellor and Sergey Prokopyev after 197 days in space. Russland will in eineinhalb Jahren Kosmonauten und auch Weltraumtouristen in nur eineinhalb Stunden zur Internationalen Raumstation ISS bringen. A satellite launched in September, NASA’s ICESat-2 ,or the Ice, Cloud and Land Elevation Satellite-2, is revealing previously unmapped valleys in Antarctica, filling in details of the terrian that other satellites can’t see. But ICESat-2 isn’t only out to create ice sheet maps; it is also gathering information on other parts of the world, including the heights of land terrain, rivers, lakes and forests, as well as the depth of seafloors. Insgesamt 24-mal soll die Nasa-Sonde „Parker Solar Probe“ durch die Atmosphäre der Sonne fliegen. Vom 31. Oktober bis 11. November 2018 unternahm sie ihren ersten Durchflug. Nun hat die Nasa die ersten Bilder des Rekordflugs veröffentlicht. The Parker Solar Probe is doing well after its first flyby of the sun, and it will soon begin returning groundbreaking data about how our star behaves. Yesterday (Dec. 12), four researchers gathered at this year’s fall meeting of the American Geophysical Union (AGU) in Washington, D.C., to share the early success of NASA’s Parker Solar Probe. After a more-than-four-year adventure spanning endless reviews, PowerPoint slides, CAD models, and engineering models, I’m super excited to report that the flight versions of the Mars 2020 rover Mastcam-Z left and right cameras, as well as their electronics assembly that will go inside the rover, have been fully assembled! Their first test images look great, and every reasonable indication so far is that the careful planning of the design and fabrication of the hardware has resulted in cameras that will meet our science and mission requirements! Woo-hoo! More than 200 photos taken by two small rovers on an asteroid show no signs of a smooth area for the touchdown of a spacecraft early next year, Japan’s space agency said. The Japan Aerospace Exploration Agency (JAXA) said the two solar-powered rovers have become inactive and are probably in the shade but are still responding to signals after three months, exceeding their projected life of several days. More than 200 photos taken by two small rovers on an asteroid show no signs of a smooth area for the touchdown of a spacecraft early next year, Japan’s space agency said. The Japan Aerospace Exploration Agency (JAXA) said the two solar-powered rovers have become inactive and are probably in the shade but are still responding to signals after three months, exceeding their projected life of several days. Call it a cosmic coincidence: Two probes launched four decades apart, traveled in opposite directions — and used similar instruments to gather milestone data within hours of each other. That scientific poetry took place on Nov. 5. Without orchestrated calculations or trajectory maneuvers, the grizzled Voyager 2 probe crossed into interstellar space the same day that the freshly launched Parker Solar Probe made its first close approach to our sun. Both spacecraft were equipped with unique Faraday cup instruments, which they used to gather milestone data about nearby highly charged plasma particles streaming off the sun. A comet is set to pass close to Earth this weekend, providing a treat for skywatchers — and for astronomers hoping to learn more about the building blocks of the early solar system. A new video gives a bird’s-eye view of the ancient lake bed that NASA’s next Mars rover will scour for signs of long-dead life. Last month, NASA officials announced that the 2020 Mars rover will touch down inside the 28-mile-wide (45 kilometers) Jezero Crater, which lies about 19 degrees north of the Red Planet’s equator. After meticulous testing of the spacecraft’s four high-tech ion thrusters, the mission team have now fired up the spacecraft for its first thruster burn ‘arc’. Travelling nine billion kilometers in total, BepiColombo will make nine flybys at Earth, Venus and Mercury, looping around the Sun 18 times. Launched in December 2013, ESA’s Gaia satellite has been scanning the sky to perform the most precise stellar census of our Milky Way galaxy, observing more than one billion stars and measuring their positions, distances and motions to unprecedented accuracy. The second Gaia data release, published in April, has provided scientists with extraordinary data to investigate the formation and evolution of stars in the Galaxy and beyond, giving rise to hundreds of scientific studies that are revolutionising our view of the cosmos. WASHINGTON — President Trump on Tuesday directed the Department of Defense to establish a U.S. Space Command as a unified combatant command. Vice President Mike Pence announced the presidential decision on Tuesday during an appearance at Kennedy Space Center, Florida, along with Air Force Secretary Heather Wilson. Editor’s note: Rocket Lab is now aiming for an 11 p.m. EST launch of NASA’s ElaNa-19 mission on Saturday, Dec. 15 (0400 Dec. 16 GMT), after several days of bad weather. Original story: Bad weather forced the private spaceflight company Rocket Lab to postpone the launch of more than a dozen small satellites, including 10 for a NASA education program, late Wednesday (Dec. 12). A NASA spacecraft originally built as part of the previous effort to return humans to the moon is now playing a key role in the new effort at human lunar return, including aiding commercial landers. One element of the Vision for Space Exploration, announced by President George W. Bush in 2004, was a series of robotic missions to the moon intended to start no later than 2008. The first such mission was an orbiter to collect high-resolution imagery of the lunar surface and other data to assist planning for future robotic and lunar lander missions. Blue Origin plans to conduct the next test flight of its New Shepard suborbital vehicle Dec. 18 as the company moves closer to flying people into space. In a statement Dec. 17, the company said the next New Shepard flight, designated NS-10, will take place Dec. 18 at 9:30 a.m. Eastern from its West Texas test site that has hosted all previous New Shepard tests. 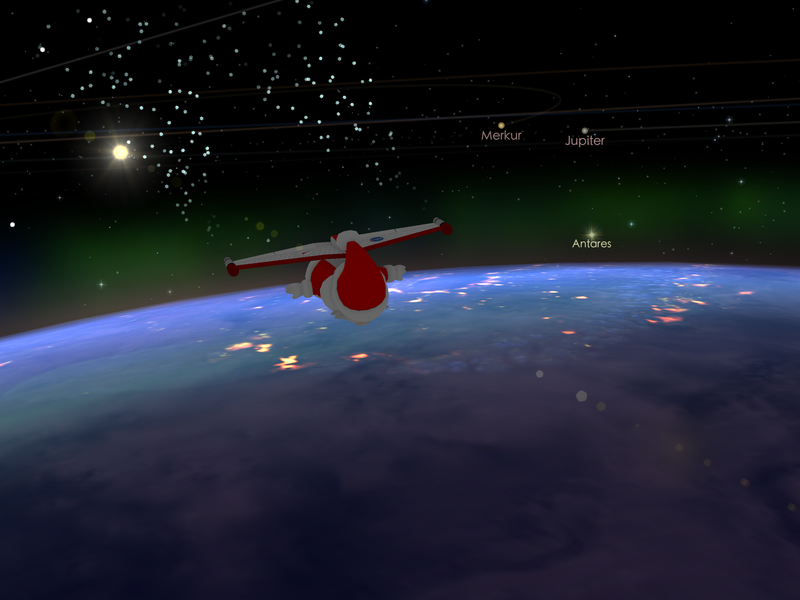 The flight, like several past flights, will be webcast. The statement came after the publication by the Federal Aviation Administration of restricted airspace around the company’s launch site for a three-day period starting Dec. 18. UPDATE for 9 am ET: Blue Origin has officially called off today’s launch of a New Shepard spacecraft carrying NASA experiments due to a ground issue. „We are scrubbing today’s #NewShepard launch due to a ground infrastructure issue. The vehicle is in good standing. Stand by for updates as we see what weather looks like for tomorrow,“ company officials said. ESA’s Euclid mission has passed its critical design review, marking the successful completion of a major phase in the progress of the project. The review verified that the overall mission architecture and detailed design of all its elements is complete, ensuring that it will be able to perform the unprecedented galaxy survey needed to tackle the mysteries of the dark Universe, and clearing the way to start assembling the whole spacecraft. The whirlwind second season of National Geographic’s „Mars“ concluded Monday tonight (Dec. 17) with a bang. In this final episode, the world watches as boundaries are pushed and lives are both saved and lost on the Red Planet. Der türkische Präsident Recep Tayyip Erdogan hat eine nationale Raumfahrtagentur gegründet. Nach dem ersten Flug ihres Mannes Oleg (23. 10. 2012 – 16. 3. 2013) hatte die Journalistin Julija Nowizkaja erstmals in der Geschichte der russisch-sowjetischen Raumfahrt ein sehr persönlich gehaltenes Tagebuch veröffentlicht (siehe dazu meine Rezension vom 17. März 2014). Nunmehr liegt die Fortsetzung über den zweiten Flug (17. 11. 2016 – 2. 6. 2017) vor. Das Kosmodrom Baikonur, das Russland bis 2050 von Kasachstan gepachtet hat, wird jetzt per Video überwacht. Die Europäische Weltraumorganisation (ESA) und das Deutsche Zentrum für Luft- und Raumfahrt (DLR) bündeln ihre Kompetenzen: In den Bereichen Missionsbetrieb und Bodeninfrastruktur werden das Europäische Raumfahrtkontrollzentrum (ESOC) in Darmstadt und das Deutsche Raumfahrtkontrollzentrum (GSOC) Synergieeffekte nutzen und gemeinsam neue Konzepte, Technologien und Verfahren entwickeln. Die Unterzeichnung des Kooperationsvertrags erfolgte am 18. Dezember 2018 am DLR in Oberpfaffenhofen im Rahmen des „Interoperability Plenary“ Treffens, welches Vertreter von weltweit 12 Raumfahrtagenturen zusammenführt. The first-ever private moon mission is expected to launch in February 2019, and it will carry some extra-special Israeli cargo to the lunar surface. The nonprofit SpaceIL and the government-owned corporation Israel Aerospace Industries (IAI), which manufactured the spacecraft, announced in a statement Monday (Dec. 17) that the lunar spacecraft, dubbed Beresheet will carry a digital time capsule with Israeli national memorabilia. NASA has serious plans to send astronauts back to the moon by 2028, and the agency is looking for help from U.S. companies to develop technology to accomplish this feat. On Dec. 13, NASA announced plans under Space Policy Directive-1 to partner with U.S. companies to design and develop new reusable systems for astronauts to land on the lunar surface, according to a statement from the space agency.